Who am I? I am a writer, or at least I aspire to be one. I am a teacher. I am a wife and mother. And I am a believer. Why am I Mormon? I came by my religion the easy way. I inherited it from folks like my Great-Great Grandmother Decker who crossed the plains as an almost single mother and helped found Parowan, Utah. But my faith, the reason I stay? Now that raises a different question entirely. My wilderness hikes and forest prayers have never led me to burning bushes or shining pillars of light. No angel ever stopped my tracks on the road to Damascus. And yet, like the Savior’s companions in a storm-tossed boat, I have received the witness of peace. I have read the scriptures, seeking for wisdom, and marveled as words once spoken to prophets took new life in direct answer to my pleading. I have knelt in prayer and felt the warmth of the Comforter envelop me. I have taken the advice of the Book of Mormon prophet Alma to "experiment upon the word" (Alma 32:27), acting on subtle promptings, and I have watched my faith grow as the Lord took my hand. I have a dear friend who challenges my faith. 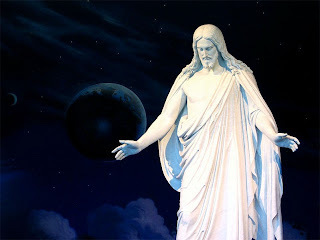 She cannot fathom how I can accept the history of polygamy in The Church of Jesus Christ of Latter-Day Saints or support a priesthood to which I cannot be ordained. I have thought a great deal about that. Every Mormon woman at some point has to grapple with her relationship to these issues of faith and others like them, and unfortunately epiphanies come with a built-in “non-transferrable” clause. God knows the value of a good test of faith, and pioneer ancestry hardly makes one immune to the need for conversion. For me, that conversion has come in stages. As a young adult, fresh out of the comfortable arms of home, I read scriptures on a mountainside in Wyoming and recognized a tender mercy in the magnificent double rainbow that appeared just when I needed a creative “hello” from my Heavenly Father. As a young widow, I came to the quiet realization that God’s plan of happiness was true. The plan became more than merely a lesson taught by young missionaries or enthusiastic Sunday School teachers. We really do live again. Families can last forever. While the angel Moroni very kindly lets me sleep at night, God has sent me numerous angels from all walks of life. He continues to supply the wisdom that I lack. I cannot deny that. I am a believer. J you were an angel on my road to Springfield. Thank you for that and your fresh faith in all things holy.